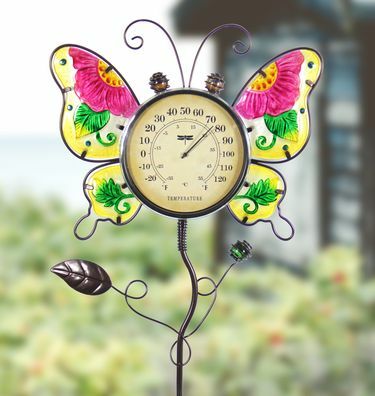 Beauty meets function with this adorable new Butterfly Thermometer Garden Stake. Beautifully hand painted with great details and made of glass and metal, this butterfly garden stake makes a colorful, fun and practical addition to any home. Made of durable metal and glass, hand painted and UV treated to resist fading. Add some functional charm to any home garden! Size: 13" x 1" x 36" H.